The Eurotoolbox 2017/18 is touring school and public libraries across the UK. Where has it been so far? Join us for a day of talks and debates and learn how to meet future challenges of the information profession head-on. 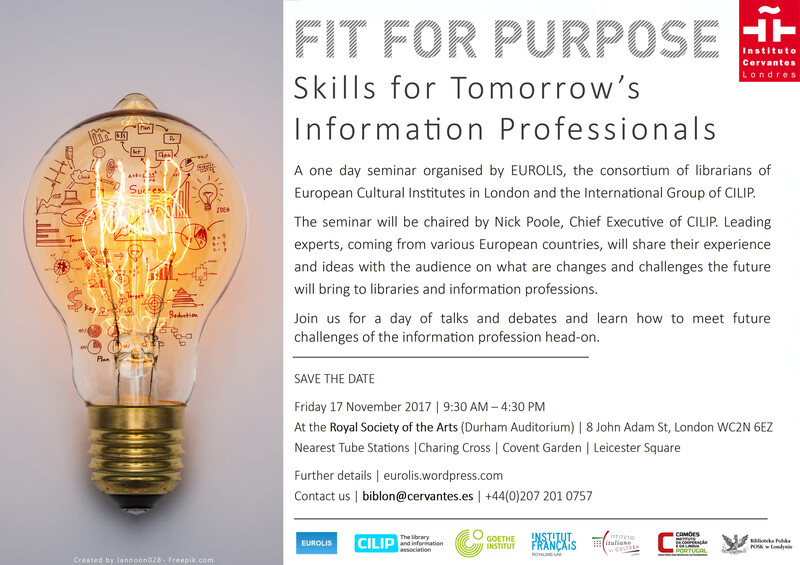 On Friday, 17 November 2017, renowned information professionals from six different countries will draw from their experience in research and practice to help you tackle future challenges: Open and Big Data, inclusion, ethical issues and many more questions concerning future day-to-day work in the library and information sector. Registration open: Buy tickets here! 12:15 – 12:55 Maria Stella Rasetti, Director of Public Library Systems in Pistoia (Tuscany) and Principal Co-coordinator of a local network. Follow us on Twitter and Facebook and share this event with your friends and colleagues! Nowadays, there are new forms of use of information that few years ago we could not foresee. Many information and data-intensive organizations face very important challenges that can affect their future. Thus, the media and its relationship with the social media in the struggle for truth (or the post-truth). Universities, and their libraries, in data management in Open Science. All areas of public security in their relationship with intelligence. Governments in an open vision related to transparency. In each of these areas, information professionals should play a leading role. But for this, new skills and competencies must emerge for Library and Information Science. They will be presented in relation with other disciplines, like Communication and Computer Science. Alexandre López-Borrull holds a PhD in Chemistry and a BSc in Information Science. He is an Associate Lecturer in the Faculty of Information and Communication Sciences at the Universitat Oberta de Catalunya (Open University of Catalonia). He is a director of the BSc in Information Science. He is also the secretary of the COBDC (Official Association of Librarians-Information Scientists of Catalonia). His research interests are based on information sources and their evolution in the Internet, including scientific journals, open science and legal aspects of digital information. No one is born a reader. And it is not enough to go to school, or to access Google, to become a reader. Raising a reader is a long term journey, with as much of cognitive and verbal development as creativity, emotion and affection. It begins before the child learns the alphabetical principle and follows different pathways; some of them are fast motorways, other tortuous rails. All this routes need bridges. Librarians and teachers face the challenge of building those bridges. The development of reading skills in the 21st century is not only a matter of selecting relevant and reliable information. Educators and information professionals must nourish the need for knowledge, the wish of being aware of what is going on, the will of being part of the discourse community where decisions are made. Some (old and new) pedagogical ideas will be brought into discussion as possible resources for helping each child to find her/his own project to become a reader. Ana Luísa Costa is Assistant Professor at Higher Education College of the Institute of Setúbal (Portugal) and researcher at the University of Lisbon Linguistics Centre (CLUL). She teaches different courses of Didactics and Linguistics in training programs for pre-school teachers and Primary school teachers. As a researcher, her work is focused in early Literacy and Educational Linguistics. MARIA STELLA RASETTI is the Director of Public Library Systems (Services) in the city of Pistoia (Tuscany) and Principal Co-coordinator of a local network consisting of 50 Libraries and Archives. The San Giorgio Library is the main library in the district and is one of the largest and more innovative libraries in Italy. She has considerable experience as Professor of Library Science at the University of Florence and as a trainer at several workshops on library marketing and communication. She has written numerous essays on these subjects and published her first book “The transparent Library”, in 2003. She is presently writing a new book with the title “The Librarian, the Best Job in the World”. Since 2011 she has been engaged in presenting the role of public libraries not only as spenders of public funding, but rather as creators of new riches, facilities and services in and for local communities. Thanks to a strong network of “allies”, she is daily engaged in overcoming the economic downturn and in strengthening and fortifying the role of a local public library at the heart of its community. What are the demands on today’s and tomorrow’s information professionals? The Commission for Training and Professional Profile of the Association of Information and Library Professionals (Berufsverband Information Bibliothek e.V.) understands a wide spectrum of professional activities for information and multimedia specialists. The commission supports, develops and promotes the profession in many ways and responds to the future challenges to library education and training. Silke Hoffmann has been the Acting Director of Reutlingen public library in South Germany since 2011. Mrs. Hoffmann studied Library and Media Studies Management at the Stuttgart Media University where she graduated with a diploma thesis about training in German libraries. She began her career in the library sector as the director of the Pfleghof public library in Langenau near Stuttgart. After two years, Mrs. Hoffmann became manager of the Oeffingen branch of the Fellbach public library. In 2011 she became Acting Director of Reutlingen public library. As a certified training provider Mrs. Hoffmann is an active member of the Commission for Training and Professional Development of the German Professional Association of Library & Information Professionals. Information, knowledge and creativity are at the heart of the digital transformation humankind is going through. Data is at the heart of economic power for the new century. Knowledge is central in our «knowing societies», and a major asset for countries who have made it the basis of their growth. In-service training it is a necessity as working life is being radically transformed by technological progress and changing economic demands. In this respect there are many stakeholders: Wikipedia, Google, MOOCs, Amazon with its prompt home-delivery and purchase suggestions based on similar client’s choices, or the more instantaneous online streaming platform, to the larger and more intuitive web-based catalogues. So then, what is the added value of public libraries? There are a number of public issues: regarding adults, 30% of the population, that have not acquired the basic skills are currently excluded from our society. Giving access to individual empowerment through culture so they become involved in the changes to come. Keeping imagination and creativity alive, as that is our superiority to learning machines. At this turning point, in order to succeed we must rely on Artificial Intelligence and digital technologies to rationalize the management tasks. Those without added human value: shelving, processing of all the items, on-line suggestions. What should be maintained are the key professional accompaniments, when the items are being borrowed and returned by not having a fully automatic treatment. We have to create an alliance of very different trades: computer scientists who will develop suggestion algorithms, which unlike Amazon will introduce discovery and so boost our mediation; experts in their respective fields, who willingly share their knowledge; service designers to create different qualities and levels of services (according to whether you are in the library during the day, at night or on the online portals). All will have in common strong relational skills to give advice, and be competent in cognitive science to promote the appropriation of knowledge and methods of innovation to continue to surprise users and to provide easy access. This will require constant updating of our knowledge, and a sustainable collective dynamic. Eléna Da Rui was born in 1984. She began her higher education studies with an intensive course in literature and history after which she went on to study Administrative Science and the Sociology of Public Policies. She began working as chief librarian in the city of Châtenay-Malabry, south west of Paris. She then had the opportunity to take classes in the Lab Session « Innovation, Foresight and Sustainable Development » at l’Institut des Futures Désirables” [the Institute for Desirable Futures]. This intellectual inquiry into the future gave her the taste and tools to believe that building a better future is achievable, that it is even the goal of public intervention. Since then, she has been trying to connect foresight data with reading and cultural policies. She is now manager of Creteil’s four public libraries under the local authority of Grand Paris Sud Est Avenir [Grand Paris South East Future], one of the 12 districts of the new Grand Paris.